Having space for your pet to roam free in your garden is a luxury that many pet owners can only dream of. But if you are a pet owner who is lucky enough to have a garden for your beloved companions, you’d be wise to take to take these three steps to check that you have a safe and pet friendly garden. Who can blame a pet for wanting to explore new and unconquered areas each day? We’re all for free-spirited explorers, but sadly, this is how pets escape and get hit on the road each year. As a pet owner, it’s your responsibility to decide your pet’s no-go zones – and this means that yes, you may need to construct a perimeter to keep them safe. To construct a physical barrier to protect your pet, chicken wire (cheap and flexible) is a popular option. Another idea is to use any leftover wood planks you might have lying around your garage or you can negotiate from a local builder who has excess. Professional netting can also be purchased and/or installed (ideal for cat runs – ours is still going strong after 5 years). And/or if you visit your local hardware store, you’ll probably find a few other garden fencing options that can double as pet protection barriers. Did you know that according to a survey of 2,000 pet owners in the UK, 15% of the dogs and cats who have eaten poisonous flowers have sadly passed away? To help prevent this from happening, be very careful about which plants and fertilisers your pet shares a garden with. According to Home Advisor, non-toxic fertilisers to consider for your garden include manure seaweed and compost, whereas toxic fertilisers to avoid include cocoa bean mulch, bone and blood meal and fish meal. Non-toxic plants include: daisies; orchids; bamboo; jasmine; and roses. Toxic plants include: lilies; daffodils; oleanders; tulips and amaryllis. However, this list is not exhaustive, so please do your own research too, in order to ensure you’ve done everything possible to keep your pet safe in your garden. Pet friendly furniture can mean both furniture designed exclusively for your pet, as well as outdoor furniture designed for you (that needs to be able to withstand your pet’s scratching and strength-test experiments). Want to see more tips and a full pet-friendly garden infographic? 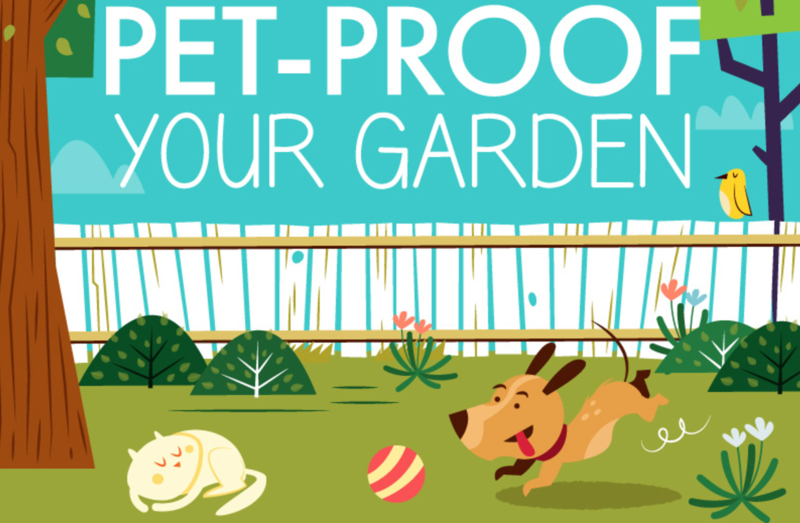 Visit How to Pet-Proof Your Garden by Home Advisor. Credit goes to Home Advisor for our feature image snippet and our inspiration for today’s post.